Too busy to attend a classroom course or just prefer the flexibility of studying at your own pace at home? You can study RYA Day Skipper Theory or Yachtmaster Theory at home using Elite Sailing's own animated and narrated presentations together with authentic RYA materials and exercises. We first developed our distance learning courses in 2010 based on more than 10 years of experience in delivering classroom and practical training. 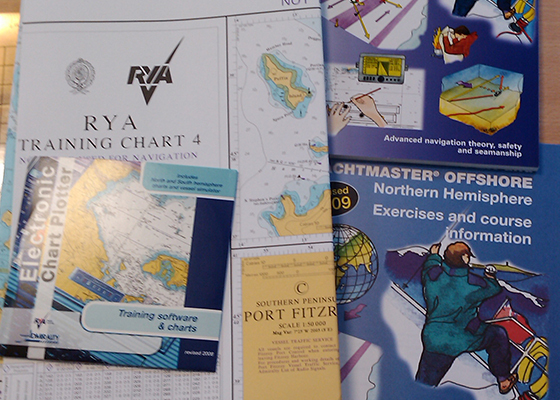 The programmes and study materials have been examined and approved by the RYA. They have already proved to be highly popular, enjoyable and successful with many people in the UK and abroad completing their studies and passing the examinations. Feedback from students has been very positive and success rate in the final test has been excellent. Prices for our RYA Day Skipper and Yachtmaster Distance Learning courses are extremely competitive because they are our own product with no middle-man to pay. And as our past students testify, there is no sacrifice in quality or effectiveness. And if you find that home study doesn’t suit you after all, you can always upgrade to a classroom course just by paying the difference. So you have nothing to lose and lots to gain. You choose your course, decide if you want us to supply the plotter and dividers, and send an email or complete the enquiry form on this page. We will enrol you and send you a link to internet pages where you can complete the booking and pay on line or by card details over the phone. As soon as you have paid we send you the complete study pack by courier or Royal Mail special delivery. Delivery is usually next working day for orders received before 1100. You study the material – most of it using the Elite Presentations on disk running on your PC or Mac – and work through the RYA exercises. The presentations are supplied on a USB flash memory and run in your web browser. An internet connection isn’t required. If you have difficulty you can get help via email and telephone. The Day Skipper Theory course requires about 60 hours of study including exercises. The Yachtmaster Theory course requires about the same time if you you are already conversant with the material at Day Skipper level. The material is modular so you can work through it in bite-size pieces of one or 2 hours at a time and revisit subjects as many times as you like. You can complete the course in about one week of hard work, but most people take a month or more. There is no time limit for completion but we encourage you to get it all done within 3 or 4 months. When you have completed about 60% of the modules you can complete a short progress test and send it to us. We will then confirm that you are on track. When you have completed the whole course of study and think you are ready, you contact us and request the final examination. We send it to you (normally by email). You complete the papers and send your answers, together with chartwork constructions on the charts and workings, back to Elite Sailing. We mark the papers and if you pass we send you the certificate. Day Skipper Theory Distance Learning Pack. Elite Sailing Study Guide and a USB Flash memory drive with full course presentation by interactive slides with animation and narration, animated worked examples for all RYA exercises, RYA student pack including charts, exercises, the RYA Yachtmaster course notes booklet and a voucher with a key to allow on-line access to the RYA electronic chart plotter. An RYA Training almanac is included on loan. Exam paper marking, instructor support and the certificate is included. All UK postage is included. No other publications are required (but we always recommend additional reading to widen your knowledge). 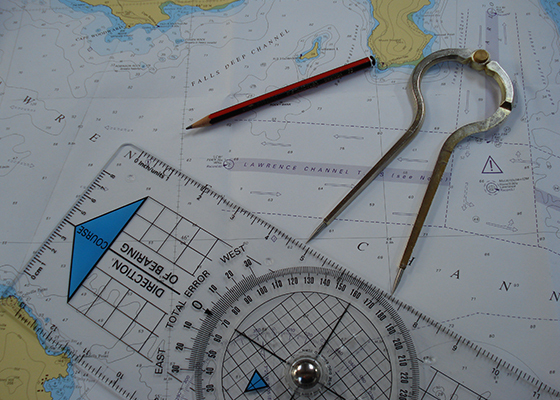 Coastal Skipper and Yachtmaster Theory Distance Learning Pack. Elite Sailing Study Guide and a USB Flash memory drive with full course presentation by interactive slides with animation and narration, animated worked examples for all RYA exercises, the RYA Book of Navigation (a standard text book worth £15), RYA student pack including charts, exercises, the RYA Day Skipper course notes booklet and a voucher with a key to allow on-line access to the RYA electronic chart plotter. An RYA Training almanac is included on loan. A practice paper, instructor support and the final Exam paper marking and the certificate is included. All UK postage is included. No other publications are required ( but we always recommend additional reading to widen your knowledge). A pc (Windows or Mac) with an internet browser. An internet connection is not required because the training media is supplied on USB memory. Portland Plotter and Dividers. We can supply this with your study pack. Price £25. Soft pencil and soft eraser. Personal exercise book.